I always enjoy collecting unique and strange stamps, which includes controversy ones. And here is my Top Ten. Enjoy! No. 10. 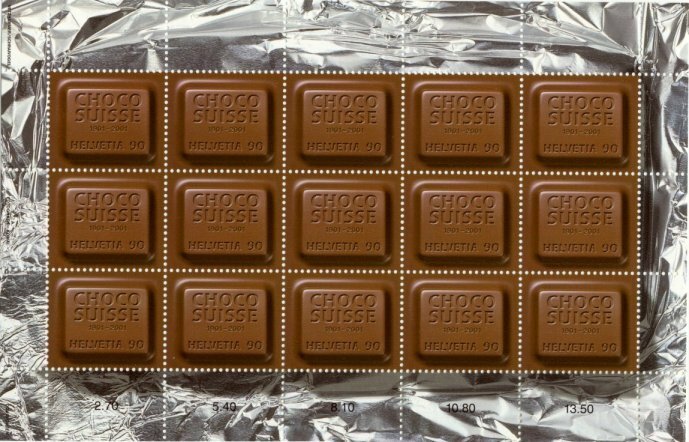 The Chocolate-Scented Stamp (Switzerland, 2001) - Came in a foil-wrapped booklet, much like a chocolate bar, really makes you want to lick it. But don't bother. 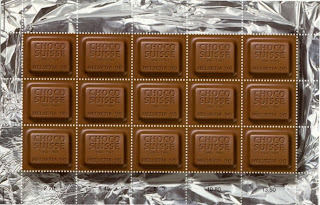 It only smells like chocolate; it tastes like plain old stamp glue. No. 9. Paper Cut Stamp (Liechtenstein, 2012) - For the first time, a postage stamp has appeared in silhouette form. This process is one of the oldest folk arts in China and was applied to the special stamp, using state-of-the-art laser technology. No. 8. 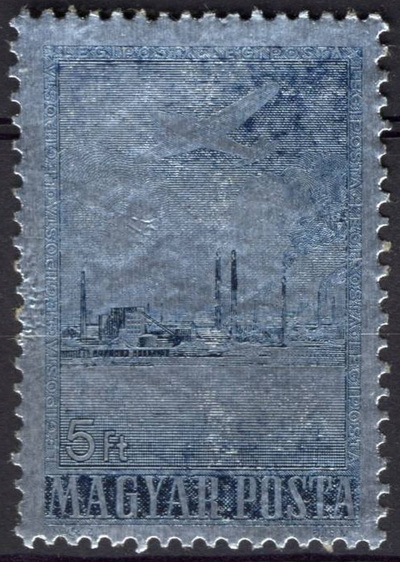 Metal Stamp (Hungary, 1955) - On October 5, 1955, Hungary Post issued the world’s first metal stamp which was printed on Aluminum foil. No. 7. Silver Stamp (France, 2010) - The 2010 FIFA World Cup was commemorated on a France silver stamp of equal nominal value. 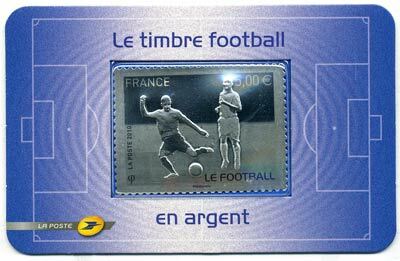 It’s interesting to know that the first ever silver stamp issued by France was in 2005, depicting the Marianne. No. 6. 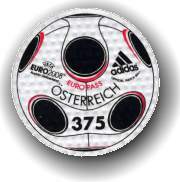 Soccer Ball Stamp (Austria, 2008) - Made of soccer ball material, this stamp celebrates the UEFA Euro soccer tournament which took place in June 2008. The tournament is the largest sporting event ever held in Austria. No. 5. 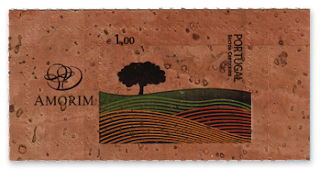 Cork Stamp (Portugal, 2007) - Printed on thinly sliced cork to commemorate Portugal's cork industry, which produces around 30% of the world supply. Every stamp is unique due to the cellular nature of cork. No. 4. 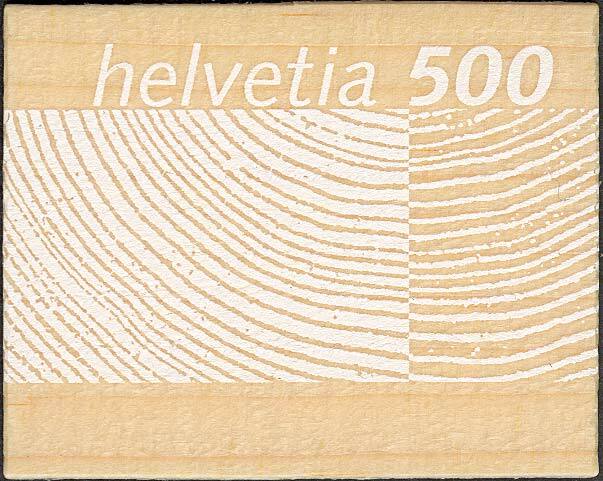 Wood Stamp (Switzerland, 2004) - Made from 120-year-old fir trees from Swiss forests. 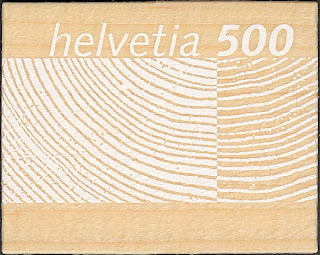 Like the cork stamp above, due to the nature of the underlying growth characteristics, every single stamp is naturally unique. No. 3. 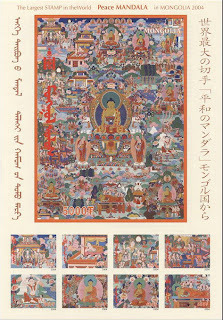 Peace Mandala Stamp (Mongolia, 2004) - Measuring 132mm X 182mm, this is the largest stamp in my collection, i believe is also the largest stamp in the World! No. 2. 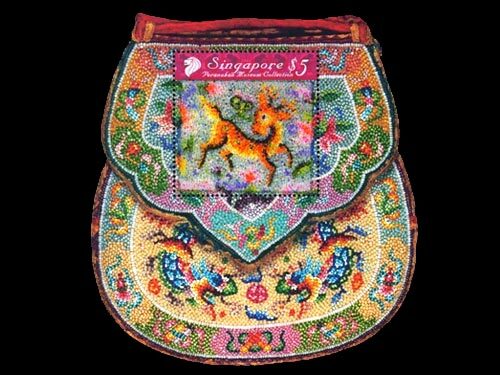 Beaded Stamp (Singapore, 2008) - Intricately pasted by hand with ‘caviar beads’, this colorful stamp is inspired by the exquisite beadwork which is a distinctive aspect of the Peranakan culture. Reputed for their creativity, the Peranakans used brilliantly-coloured miniscule glass beads to create intricate designs on anything from slippers to tobacco pouches. No. 1. 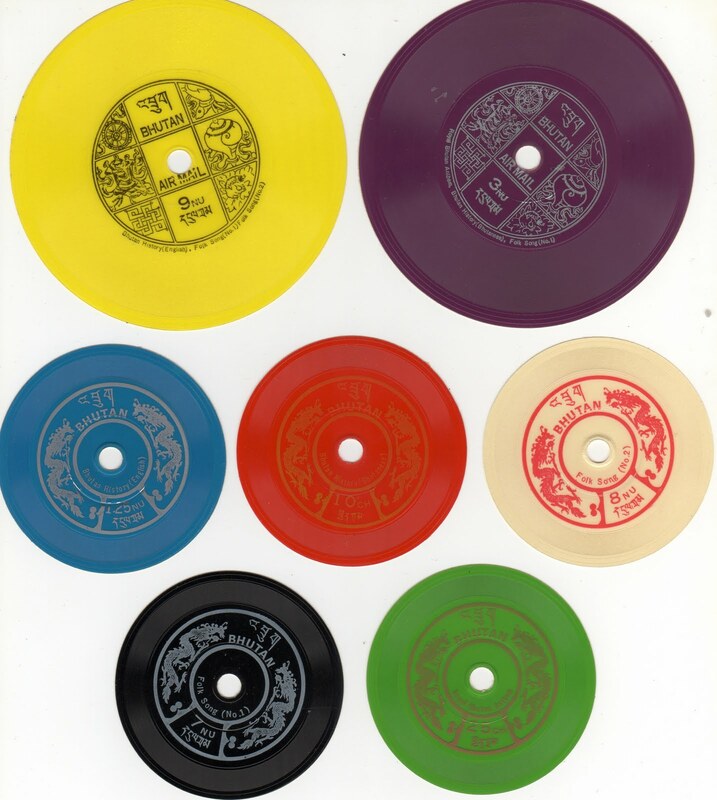 "Talking" Stamps (Bhutan, 1973) - Tiny vinyl records self-adhesive set that played Bhutan’s national anthem and a brief history of the country when spun on a phonograph! And how could I miss the chance when I saw this miniature sheet on sale on eBay? 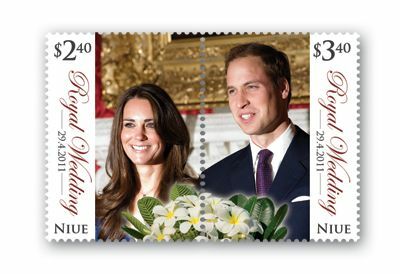 To celebrate the Royal Wedding of William Prince of Wales to Catherine Middleton on 29th April 2011, the tiny Pacific island of Nuie has issued a miniature sheet of William and Kate. However, it is causing both chuckles and consternation among royal watchers. The picture of the couple is split down the middle with perforations! So who say collecting stamps is boring? ;) That's all folks! Enjoy ur weekend! Good day to you! A warm welcome to my blog! I collect stamps of the first issues (first postage stamp issued by any nations), stamps of U.S.A. & P.R.C. 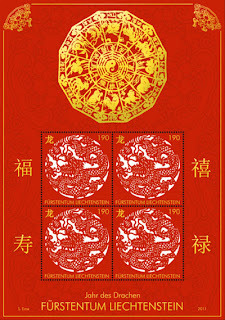 origins and topical stamps of tortoises and turtles. However more often than not, I am swung by beautiful stamps outside my collecting areas! So end of the day, I collect everything (LOL). I am also interested to exchange covers from all corners of the world. So if you are interested, pls do not hesitate to send me a cover to my postal address and i will revert back to you with a beautiful cover from Singapore. Enjoy your stamps! Postman's Uniform FDCs From Malaysia! 3 Beautiful Covers To Share Today! Beauties of Our Homeland Cover from Slovakia! Protected Mammal Species FDC from Taiwan! How much time do you spend per wk working on your stamp collection?Include reading periodicals, blogs, auctions, forums, daydreaming about stamps etc. 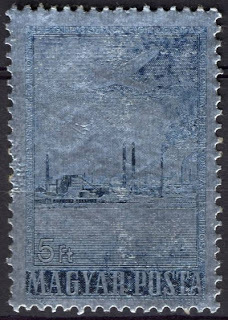 Some Interesting Philatelic Blogs Not To Be Missed! Malaysian Honey Bees FDC, posted on April 9, 2019 from Penang Taman Chai Leng to Tapei with arrival postmarked on April 23, 2019. Cover plastic bag from Russia. And Santa Claus remembered us again, as can be seen on this gorgeous cover sent from Santa's Office in Napapiiri:) Via Giovanni. Grazie mille!!! Hi.. I just received this card . Strrrekozzza sent me from Russia. But I don't know what picture is about. Anyway thank you very much for the card. Thank you! Muchas gracias, Eduardo!